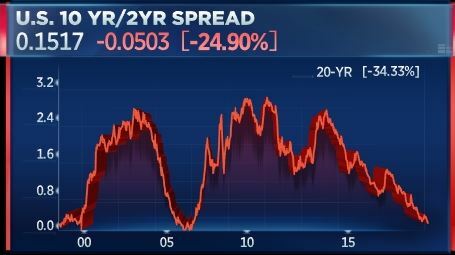 Traders have been fretting about the flattening of the yield curve — which is when interest rates on longer duration Treasury notes, like 10-years, get closer and closer to shorter term interest rates, like 2-years. 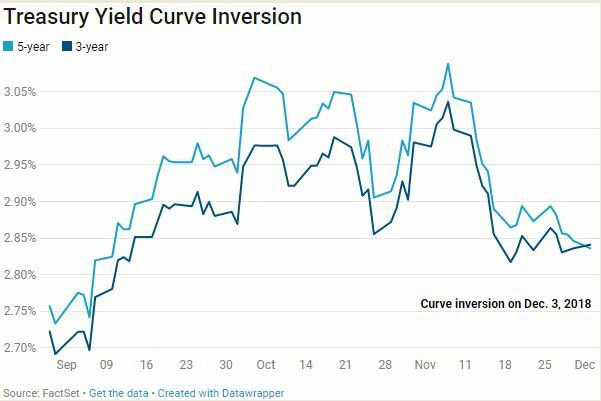 The real fear is that a 'flattening curve' could lead to an inversion—where the longer duration yield actually sinks below the shorter duration yield - because that signals a recession. That 'inversion' occurred Monday between 3-year and 5-year notes and 2-year and 5-year notes, and traders think that means the widely watched 2-year to 10-year will also soon invert. But not everyone agrees it's a dire sign for the economy, and one strategist said: "Normally, I think the bond market people are geniuses but not today. Does it really think there's a recession coming? I don't think so." But not all strategists agree with the dire warnings, though they do note some unusual behavior. On Monday, the difference between the 10-year Treasury yield, at 2.97 percent, and the 2-year yield, at 2.82 percent, dramatically narrowed by 5 basis points, the biggest one day move since late March. On Tuesday, the gap narrowed even more to as little as 13 basis points as the 10-year hit 2.95 percent. Traders have been watching the difference between the yields on various Treasurys for months, along what is called the yield curve between the longer and shorter-term bonds. And in this time, the longer duration 10-year yield has gotten closer and closer to the yield on the 2-year. If the two should flip, and the 2 -year yield actually rises above the benchmark 10-year, that inversion would be a signal of a recession. "It speaks to the potential for the 2s and 10s to invert," said Ian Lyngen, head of U.S. rate strategy at BMO. The timing could vary, he said, depending on the cycle. But it's typically a matter of months, not days or weeks, when such an event could happen. "That might put 2s and 10s inversion on the table by the end of the year, and if not, then around the March FOMC meeting," Lyngen said. A lot of this is traders reading tea leaves. 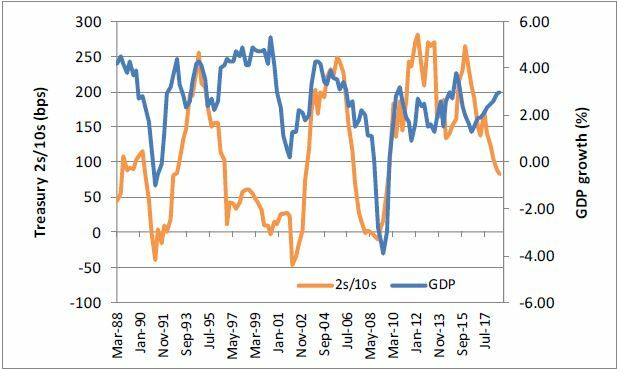 An inversion of the 2- and 10-year yields has been a reliable recession indicator in the past. Not all inversions have led to a recession, but recessions have always been preceded by inversions, according to Michael Schumacher, director of rate strategy at Wells Fargo. Between 1988 and 2008, inversions of the 2s and 10s were followed by recessions about 24 months later, according to Wells Fargo. The 10-year Treasury yield briefly dipped below 3 percent just after Fed Chairman Jerome Powell spoke last week for the first time since Sept. 18. The 3 percent level is a psychological milestone that the 10-year has spent much more time below than above since the financial crisis. The move higher in September was seen as an important step into a new range, in reaction to Fed rate hiking. Some say pensions are buying the 10-year because with higher stock prices, they have closed their funding gap and now are looking for safety plays. There is also talk of heavy buying from Asia, and some traders point to short-covering. Others point to reduced fears about inflation, making the 10-year more attractive. They also note that the 10-year yield will move lower with the German bund, which yields just 0.28 percent, and that central bank purchases of assets continue to depress yields. "I wouldn't pay too much attention to that particular move but I think the front end is more interesting," said Schumacher. He pointed to comments from Fed Vice Chairman Richard Clarida and said the market appears to be ignoring him. "If you listened to Clarida, he said in a nutshell that central banks have to worry about inflation going too low. That would imply to me a less aggressive Fed tightening, and you think that would drive down the front end down." The 2-year yield is most reflective of Fed policy, and it is at the same level it was roughly at before Powell last Wednesday said the Fed was close to neutral, implying fewer rate hikes. "There's something going on with worries about growth, not withstanding this trade deal," said Peter Boockvar, chief investment strategist at Bleakley Advisory Group. Boockvar said the fact that the agreement to hold off on new tariffs for 90 days while U.S. officials negotiate with their Chinese counterparts has now created a 90-day period of uncertainty. "If I'm a company, I must just hold off until the second quarter to make a decision. That could slow growth, just sitting and waiting. Maybe that's what the bond market is sniffing out," said Boockvar. Before the financial crisis, the 2s to 10s curve first inverted briefly at the beginning of 2006, then again in the middle of that year. Its last inversion was in 2007. As the bond market reflected fear, stocks rallied Monday on the trade ceasefire. The Dow was up 287 points, or 1.1 percent. "The last time we inverted...the party kept going on," Boockvar said. "The credit markets were in flames but the stock market went on to an all time high in October 2007...They thought the Fed was going to save the world." Boockvar said Fed officials have argued that a more realistic curve to watch is the 3-month to the 10-year because the 3-month more closely reflects the fed funds rate. That difference between the two was nearly 60 basis points. But the market watches the 2-year and the 10-year curve. "Normally, I think the bond market people are geniuses but not today," Schumacher said. "Does it really think there's a recession coming? I don't think so."